I updated some of the mesh designs that I use in production. some of the span layout. Thank you for re-upping those videos and images Brian :). For Blendshapes do you utilize painted blendshape regions, so you could pose the mesh in an extreme fashion and then isolate the various different sections into their own individual shape minimizing the risk of collisions. Ie Face posed into an extreme crunch. —> Individual models are generated for just the Left/Right eye, L/R Mouth, L/R Cheeks etc. Or is your setup more cluster or joint driven, given your work is more geared towards the flexible / catoonish style? For those wondering this is a technique (Tapering) that has been explored in the Stop Staring book by Jason Osipa. I am learning Maya and right and now just making blend shapes that add up. All the shapes are based on three curves adding up to be one. The LBrow makes a X shape, the LEyeLid a circle and the Mouth/Jaw and Lips make a football shape. The corners of the mouth move up/down creating the inverse shape as the jaw. Because of this type of layout I am making blend shapes that add up to make a pose. So I do not make a “smile” blend shape but rather combine multiple blends to create a smile pose. I look at the face as having five zones and as each zone crosses over into another I fade off the combo of those zones to add/combined up so they play nice with each other. Here are a couple of crude Videos that I have and give you an idea of what I am talking about but I will only have them up for a small amount of time. I am redoing them because they still are a bit to vague. This is my topo for my character i working on for my short film i’d love some feed back. HD - i like your website some very usefull stuff. Nickz, Mookiemu and Laa-Yosh very impressive work. When I model I think more of spans as holding places. Flow lines are always on my mind but holding a shape is more important to me. I try to start with a nice edge flow but it changes drastically based on the shapes I am instructed to hit. There are basics that I follow and one that I see on your mesh is you need more lines between the nose and the upper lip. If you want to hit a nice lip curl, I would have a few more lines running between those two spots. Three to hold a nice valley for a lip curl. So I would have the end nose line, an end lip line and three line in between to hold the curl of the upper lip. I might have more because of some other flow coming through the side of the face and the eye. So I would have the end nose line, an end lip line and three line in between to hold the curl of the upper lip. I might have more because of some other flow coming through the side of the face and the eye. This is what i understand you’ve suggested i do? Yup, End lines are the spans that hold a shape when you have a direction change. I my models they come in threes most of the time when I am trying to hold the shape. Aka the bottom of the nose as it transitions into the upper lip. Here is a face i retopologized this week. Same philosophy as the one i posted previously just a little less dense. Of course this is Level 0 (no subDiv). Hope this helps some people out there. that looks amazing, you make it look so easy. Now this is cool… Congrats! I love the form. And the topology looks very right to me, although I am not topology specialist. Anyway, there is something about this model that scares me a little bit: You see, I like to rig and to animate, and I really have no clue on how to properly rig a so-dense topology. I imagine that going for morphing targets would be very hard in this case (even for Tapering- yes, I too read Jason Oshipa, and I think his techniques are great and accurate). Perhaps for this mesh rigging would be more like the cluster or bone based rigging? Ah, maybe that would be hard too. Shame on me, I am too much used to a lot less dense geometry, that is sweeter for either rigging method. Maybe and just maybe, could you have gone for a little less dense mesh (maybe *1/2) for this one without loosing much detail? Oh! I had missed a former post from you where you stated that high densities would become the norm… Now I am more curious to know why. Do not mistake me, I am not trying to discredit you. On the opposite, I really admire your output, and I wish that someday I could do something as great as what you do. I’ve also seen in this very forum some other masters like Laa Yosh who favour the use of dense meshes, so I think you should be right… I just want to understand why. I have take a look at your latest posts in this thread and saw they are old men. But, what about if one where to do a stylish girl like Steven Stahlberg’s, or some cartoonish, simpler forms like Pixar’s. Would you still use dense meshes in your level 0? Thanks for showing your work. Inspiring indeed! Anyway, there is something about this model that scares me a little bit: You see, I like to rig and to animate, and I really have no clue on how to properly rig a so-dense topology. I imagine that going for morphing targets would be very hard in this case (even for Tapering- yes, I too read Jason Oshipa, and I think his techniques are great and accurate). It’s absolutely not too difficult to create blendshapes for such a dense model. Brush based sculpting software works pretty well, like zbrush or mudbox. You can also build or optimize a low-res mesh on top of it, and use that to make broad edits. Combine that with Maya’s Wrap deformer or the skinWrap modifier in Max to have the high res geometry follow the low res one. As for the model I can again repeat that the mesh flow under the lower eyelids is not conforming to the wrinkle patterns usually seen there. Check Neytiri’s face mesh to see what I mean. Now I am more curious to know why. Do not mistake me, I am not trying to discredit you. More geometry gives better control of the surface curvature. It’s easier to create the appearance of skin sliding over the underlying bone structure on the cheeks, brows, jaw, bridge of the nose. You can sculpt a lot of fine forms and shapes into the blend shape, which is very useful everywhere. Just look at this test here, how nice the deformations are. 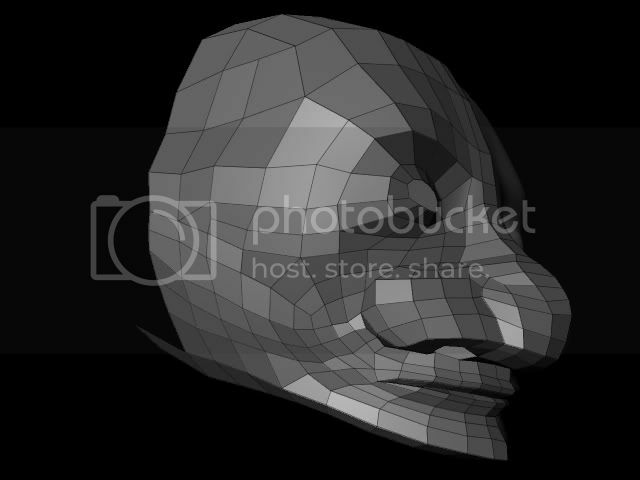 Even more geometry allows you to form all your facial wrinkles using just geometry. This keeps the rig’s complexity at bay, you don’t need to layer your deformations into both the mesh and the shader (displacement textures). Also, if you don’t have to terminate detail for the wrinkles, then the resulting subdivided mesh stays smoother. You pay a memory cost, though, but most software allow you to keep a scene with the original shape/target models and export your rig from there without the excess stuff. Current CPU’s are fast enough to deal with a 15-30k mesh for blendshapes. But, what about if one where to do a stylish girl like Steven Stahlberg’s, or some cartoonish, simpler forms like Pixar’s. Would you still use dense meshes in your level 0? Even young girls have wrinkles on their faces, and it’s easier to smooth them out in the neutral state if you have a dense mesh. Also, cartoons with lots of squash and stretch benefit from more geometry as well. But it doesn’t have to be as detailed as something for Avatar (although Tintin used the same approach but then again it’s not your Dreamworks/Pixar look). Ok, I am satisfied. Thanks a lot, Laa-Yosh! As I can see, very dense mesh (always?) have to be handled with Brush Based Sculpting… Oh, poor me, I was feeling soo comfortable with my Max graphite tools for poly modeling (true that is has a Freeform tab with tools you can use to paint displacement and all that into you mesh) but I just feel it is not powerful enough. Which of those two integrates better with Max? I am a “maxer”, you know. Maybe MB? and… do I need a Wacom to be able to model such nice forms like yours and Phrenzy84’s? I checked the Daniel Pook-Kolb’s PaintDeform script, thanks for that. It looks very cool, but I cannot use it since I am not into Maya. Bummer. Anyways, thanks for explaining. It is all very clear to me now, and I will try to move in that direction… although I know I will keep up for a little more time with my not-so-dense meshes I love so much. You don’t have to do your face rigs this way just because some of us prefer this method. There are many other approaches that are just as valid. As far as I know, Dreamworks uses bones as their primary component for their cartoon characters. There are probably a lot of custom deformers used as well, to be able to distort the faces, mouths and whatever, especially if it’s not a human character. Naughty Dog uses bones on the Uncharted games, with a bone-based alternative to corrective blendshapes, and blending between a base normal map and two different wrinkle maps. Digital Domain uses a rather generic base topology and relies on animated displacement maps for wrinkle details. They have so many individual maps that they have to run a Nuke compositing job before rendering, to calculate the blended displacement maps for each frame. You could also use full blown muscle and skin simulation, although I’d think it’s too slow for any interactive work. But apparently Liam Kemp has developed a Maxscript or plugin based tool that works like this and he’s been working on a shortfilm (The normals) for a few years using this method. 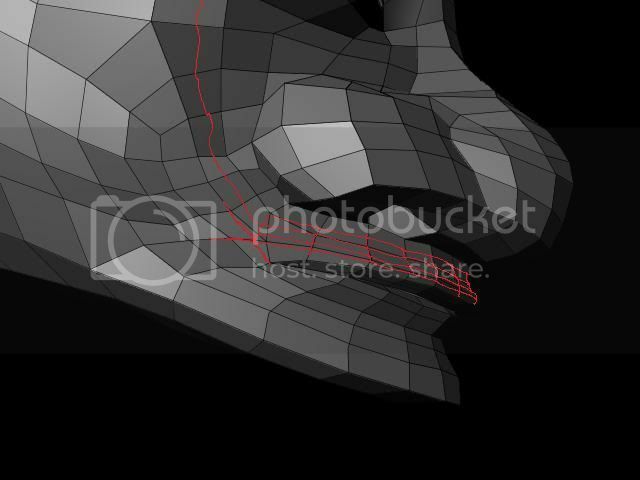 I personally prefer the blendshape + dense mesh method because of its straightforward approach, everything from basic expressions through eyelid deformations to sticky lips can be implemented in the deformer, it’s reasonably fast and you get full control over every vertex if you’re willing and able to do the required corrective shapes. Our projects have pretty compressed schedules and we have specialists so anything involving multiple fields of CG is problematic and time consuming because of all the passing around of assets and data. So we need a simple, reliable, fast method and so far nothing has beaten blendshapes for us. Sorry to barge in in the middle of this very specific discussion, but I have a question. Say I want to learn box modeling the head(yes I know that nowadays people mostly make heads in ZBrush/Mudbox/x sculpting program first and then retopologize it), because I like to know the basics first and want to try it the hard way(every way is hard, I guess). Anyway. Do any of you guys have an image or a tutorial that you would point to, that develops the head from the box in the most optimal/usual way? It would be useful if the end result also has good topology as far as good topology goes after years of experimenting with it. I know that there’s nothing like the absolute best topology that can be used in any kind of head shape imaginable, but there surely has to be something that is most widely used and considered a good topology. I have seen a lot of images of recommended topology, but there’s always something that seems to be missing(probably the “there’s nothing like best topology” point). My problem is that I have not yet seen a good tutorial that goes from a box to a head in the most optimal way(actually I have seen very little box modeling tutorials, because somehow people that make head modeling tutorials mostly use poly-by-poly techniques). Laa-Yosh, you being the master in this category, do you think you could point me in any directions?? First of all I’m no master of anything, especially not modeling. As for box modeling a head, I still believe that it’s a skill belonging in the past, that the brush based sculpting tools and retopology approach is better in every possible way. Time spent on learning about it is wasted time that could be used to develop the more important skills. With that said, Bay Raitt’s website is still online with his amazing animated gifs made over a decade ago. You can also look for Martin Kroll’s (Ambient-Whisper) stuff, I’m not sure if it’s still online. You can find him on this forum and ask about it if a google search doesn’t help. Edit: oh, and I think we all learned from Bay, at least most of us visiting his forum back around 2000. But I have no idea where he learned this or rather, how he came up with it. I learnt modelling from both Bay and Martin. I have pretty much have every timelapse they did. Studied them for ages. Thanks for the feedback Cadedra, you are very polite and am in no way offended by your questions :). I hope Laa-Yosh has enlightened you. He shares the same views as mine regarding topology especially when it comes to rigging, although i do find it weird many people don’t, but different strokes i guess. Laa-Yosh i somewhat agree with you about the model i posted regarding the lower eye region. The thing is the wrinkles, ( especially for this character ) in that area that would make themselves present though smiling or any contraction of the cheeks would be very very fine (especially from the reference i have). I feel if i had the geometry to represent even a portion of the detail in that area i should have a very dense model overall to account for the rest of the fine details that would show themselves through deformation. I have found that characters with a little more flesh in the face tend to have thicker deformations overall with very localized areas of fine wrinkles (too small at least to represent with base geometry), while those who are a little leaner have smaller wrinkles overall but with one or two creases usually being very very prominent enough to use geometry to describe them. If this was a different person, one without thick eye bags and a more angular face, i would definitely refine the flow in that area. I too look at that neytri screenshot all the time for inspiration. But i do agree with the general concept of topology in that area. I will be sure to post some facial rigs screenshot as i go along :). So, would you guys recommend that, even if I am going to model low-density meshes, I should go for brush-sculpting software and retopology? Mind I am pursuing the Pixar/Dreamworks looks for most of my works. Would all the time spent in brushing-retopo-exporting be shorter that polying right in Max? That, of course, assuming that one gains high skill. I understand that if I go for MudBox or Zbrush now my work will be far more time-consuming that my poly-cutting-skills in Max that I have mastered for so long and with which I feel so comfortable… but maybe after mastering MB or ZB would my modeling be even faster?